What started out as a means to fight seasonal allergies has evolved into a honey and beekeeping business that includes customers all over the United States and a store in the exclusive Chelsea Market in New York City. 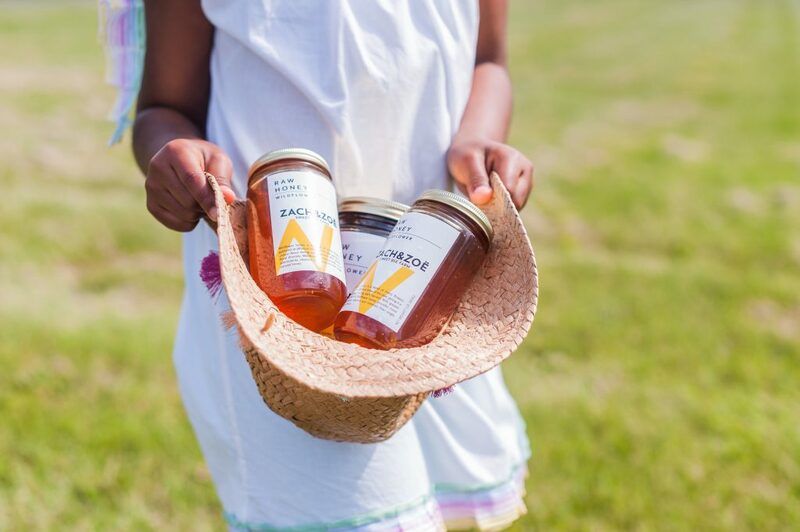 Zachary and Zoë Sweet Bee Farm, a family business based in the rolling hills of rural New Jersey, continues to set trends with its variety of honey flavors, approach to entrepreneurship and desire to help the bee population. Zachary,10, and Zoë, 12, along with their parents, Summer and Kam Johnson are revolutionizing the honey business and are showing that working with family has never been sweeter. How did your family get started with beekeeping and producing honey? Zachary: Well, it all started when we moved into our home in Hunterdon County. For a long time, my sister and I had been homeschooling, so it was hard when we started school. It was hard for my breathing to adjust to the atmosphere of the new school, but things really started to go downhill when spring came. With the combination of my allergies to pollen and running around with my friends at recess, I had an extremely hard time breathing. So much so that I had to go to the nurse’s office almost everyday, making me late to mathematics class. Although I didn’t mind missing a bit of math class (I could easily make up the work), I needed to find a way to stop my allergies. This is starting to sound like a commercial, but the real solution for me, was honey. A neighbor of ours informed us that local honey could help with seasonal allergies. Conveniently, there was a major beekeeper nearby our house, about 30 minutes. My dad and I went over to see him. He and my dad quickly became close friends. We started to buy bee hives so that I could have a tablespoon of honey each day. That’s where it all began. Zach and Zoë Sweet Bee Farm is a family owned business. What are your roles with the business? Zoë: At home, sometimes Zachary and I help my dad keep the bees. We put on our bee suits and smoke out the bees. Sometimes we give them honey water. After we smoke them out we can harvest some of the honey. Then I help my mom fill the jars with honey. Then we screw on the caps and rinse off the jars. It’s a lot like washing the dishes. Next, we put on the labels. You have to be extremely delicate with the labels, making sure they don’t tear and that they’re as straight as possible. Sometimes we put on music and have some fun. It’s even more fun when the whole family is together! We help out at Chelsea Market at least once a week. There we help to sell the honey and make transactions. It’s a team effort, really. What do you love most about having your own bee farm? Zachary: For me the best thing about keeping bees is that you’re helping the bee population. No matter how small your apiary might be, you can still help by installing a hive or two in your backyard or rooftop, as long as your town allows it. Most towns have different rules about what you can do. (Kids reading, ask your parents about what your town rules are!) Keeping bees is also really fun and rewarding. Sometimes we plant flowers in our front yard, and if you do the same, you might see a little honey bee on the flower that you planted. That’s what I love about beekeeping. What’s the hardest part about being kidpreneurs? What advice do you have for kids who want to start their own businesses? Zoë: The hardest part of being a kidpreneur for me is probably waking up early in the morning. My family and I live about an hour and a half away from New York City, so we have to wake up bright and early to beat traffic. I’m not exactly a morning person so sometimes it takes a little while for me to get out of bed. Also, Zach and I sometimes fight, as all siblings do. This can be a problem, especially when we are selling honey. The fuss normally doesn’t last long. Congratulations on opening your shop in Chelsea Market. What do you love most about having your own shop? Zachary: Great question, what I love most about having a store at the Chelsea Market is that it feels unique. There’s a lot of things that make people unique, my name is Zachary, you probably know that, but other people are named Zachary. I live in the United States of America, but there are other Zachary’s in the United States of America. Now, how many Zachary’s in the United States of America can say they have a store in Chelsea Market? As a child, I feel that that’s something special to me. You have a lot of amazing flavors in your honey collection. Which is your favorite? Zoë: My personal favorite flavor of honey is probably raspberry. Lemon is a close second. All of the flavors that we add into our raw honey are organic. They’re all delicious and I recommend you give them all a try. What’s next for Zach and Zoë Sweet Bee Farm? To learn more about Zach and Zoë Sweet Bee Farm, visit https://zachandzoe.co.